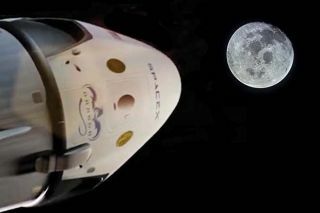 SpaceX aims to launch two paying passengers on a mission around the moon in late 2018. The rivalry between billionaire space entrepreneurs Elon Musk and Jeff Bezos may soon reach all the way to the moon. On Feb. 27, Musk announced that his company SpaceX plans to launch two paying customers on a weeklong mission around the moon by the end of 2018. Just a few days later, word leaked that Bezos' Blue Origin aims to start delivering science experiments, human habitats and other gear to the moon by mid-2020 or so. In November 2015, Blue Origin landed its New Shepard rocket after a suborbital test flight, a groundbreaking success that sparked a miniclash between Musk and Bezos. Via Twitter, Musk congratulated Bezos on the accomplishment but also stressed that landing a rocket during orbital liftoffs — as SpaceX was trying to do with the first stage of its Falcon 9 launcher — is much tougher to do. In response, Bezos said the Falcon 9 first stage doesn't actually make it to orbit before coming down to Earth, then pointed out that the SpaceX rocket performs a deceleration burn to make its "re-entry environment more benign. "So if anything, the Blue Origin booster that we just flew and demonstrated may be the one that flies through the harsher re-entry environment," Bezos said in a news conference in November 2015. "And then finally, the hardest part of vertical landing and reusability is probably the final landing segment, which is the same for both boosters." SpaceX nailed its first Falcon 9 landing a month later, bringing a first stage back safely during the Dec. 21, 2015, launch of 11 satellites for the communications company Orbcomm. Bezos congratulated Musk's company with a tweet that some people interpreted as a being bit snarky: "Congrats @SpaceX on landing Falcon's suborbital booster stage. Welcome to the club!" SpaceX plans to relaunch one of these landed first stages for the first time later this month, on a mission that will send the SES 10 communications satellite to orbit. SpaceX has long been working on a big rocket called the Falcon Heavy, and the booster is scheduled to launch for the first time this year. The 230-foot-tall (70 meters) Falcon Heavy will be able to loft about 60 tons (54 metric tons) to low-Earth orbit (LEO), making it the most powerful booster since NASA's Saturn V moon rocket, SpaceX representatives have said. The Falcon Heavy is a moon rocket of sorts in its own right: It will launch the lunar fly-around mission next year, Musk said. In September 2016, Bezos announced that Blue Origin was developing its own heavy lifter, which it named New Glenn after John Glenn, the first American to orbit Earth. New Glenn will be taller than the Falcon Heavy; the former's two- and three-stage variants will stand 270 feet (82 m) and 313 feet (95 m) tall, respectively. Falcon Heavy will be more powerful, however. The two-stage version of the massive New Glenn rocket will be capable of launching about 50 tons (45 metric tons) to low-Earth orbit, Bezos said last week. Like the Falcon Heavy, New Glenn will also be used on crewed missions, Bezos has said. Indeed, lofting people to space is a big part of both SpaceX's and Blue Origin's plans. Meanwhile, Blue Origin aims to launch the first crewed test flight of the six-seat New Shepard capsule this year and begin commercial crewed missions to suborbital space in 2018, company representatives have said. Crewed missions to orbit using the New Glenn system should come later, if all goes according to plan, Bezos has said. Musk and Bezos have similar long-term visions as well: Both men have said that they started their respective spaceflight companies primarily to help humanity get off Earth and settle the final frontier. "Our ultimate vision is millions of people living and working in space," Bezos, who also founded Amazon.com, said during a September 2015 news conference. And Musk has long stated that he founded SpaceX in 2002 chiefly to help humanity colonize Mars. In September 2016, he laid out how the company plans to do it: with a huge, reusable rocket-and-spaceship combo called the Interplanetary Transport System (ITS). If everything goes well with ITS development, the first crewed flights to the Red Planet could launch in the 2020s, and 1 million people could be living on Mars a half-century or so later, Musk said during the unveiling of the ITS concept. The ITS could also take people well beyond Mars, he added. "This basic system, provided we have filling stations along the way, means full access to the entire greater solar system," Musk said.